How can microservices be mapped to a greater solution to reduce operational complexities? Automated solutions that utilize microservices can inadvertently contribute to the complexity of the microservices when they need to be changed or updated. A logical boundary based on pre-defined criteria is applied to plan for and update microservices, and to enable operational teams to know which microservices need to change and what changes are required. Different multi-layered logical architectural views are created and each microservice is mapped to its related layer where the changes to each layer or function are then applied. The complexity of a microservice architecture can be reduced by creating logical groups of microservices based on their functions, processes and business domains. These groups are defined at a high level and must not result in any architectural impacts to how the microservices operate. The collection of existing microservices is organized into a series of layers, each representing a business entity domain. This pattern is applied by following certain rules and guidelines as to how microservices can be grouped within logical layers and how those layers relate to underlying domains and to each other, as explained in the complete pattern description. 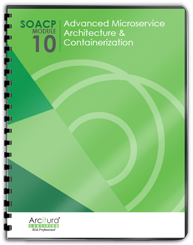 This pattern is covered in Module 10: Advanced Microservice Architecture & Containerization..
visit the Microservice Architect Certification program page..